Walkie Talkie vs Two Way Radio – What’s the Difference? / Walkie Talkies vs Two Way Radio – What’s the Difference? You’ve likely heard both terms before – walkie talkie and two-way radio – and it has probably left you wondering what they are and how they are different from each other. In short, there isn’t much separating them, but it is still really important to know how they are defined so that you are able to pick the right one for you. In this guide, we take you through a whole load of information, from the history of the walkie, all the way to how it is different from a two-way radio (and how they are the same). So, make sure you take a moment to read through and see if this article is going to be able to help you decide. The walkie talkie, also known as the two-way radio, was developed during the Second World War and initially created in 1937. Its conception is credited to Donald Hings, a Canadian Inventor, as well as engineer Alfred Goss and a team at Motorola. At first, it was used by the infantry before being further developed into models that could be used for artillery and tank units. After the war, the walkie talkie continued to be used within the military, but also outside of it. They became popular communication tools for public safety, allowing for quick communication over short or long distances to ensure that everything was running smoothly and to alert others to potential risks. For the last one on this list, it is interesting to note that there is a Family Radio Service (FRS) in the USA that allows for the use of specific channels without a license. This is very popular for those using the walkies as toys or for fun, but also amongst preppers who are getting ready for an apocalyptic event and those with a great deal of land who like to be able to check in on each other quickly. Most countries have a similar service that offers license free channels for personal use. A walkie talkie is a portable two-way radio, and can usually be held in one hand and then stowed away in a pocket when not being used. It allows you to speak using the radio while walking around, which is why it is called a walkie talkie. It is also a two-way radio in that it can both transmit and receive signals, allowing for conversations as well as tuning into multiple channels. Essentially, it is a radio that can operate two ways – so it can both transmit and receive a signal. This is different to a standard radio which can only receive, and the two-way radio comes in two different formats. The half-duplex variety allows the radio to transmit and receive, but they have to take turns and cannot work simultaneously. The full-duplex two-way radios allow for transmission and reception at the same time, so these are important aspects to consider when looking into them. So, what’s the difference between a walkie talkie and a two-way radio? After all, they seem quite similar. While a walkie talkie is always a two-way radio, a two-way radio is not always going to be a walkie talkie. The reason for this is that there are many radios that are not portable handheld models, like those mounted in a vehicle, on a desk, or even on a wall. In cases like this, those two-way radios cannot be classed as a walkie talkie. Really, a lot of it comes down to the marketing because the difference between the two forms is comparatively very small. The concept of a two-way radio has more professional connotations, implying that it has higher functions and can be used in a more professional capacity. When we see walkie talkies for sale in a store, they tend to be marketed towards children or are used for simpler communication tasks. Other than that, they are both capable of transmitting and receiving signals, and there tend to be multiple channels that you can tune into when you are trying to get in touch with someone. There is one more fundamental difference between the two though, and it all comes down to licenses. Due to the way walkie talkies and two-way radios are marketed and designed, the former tends to be the most popular choice due to the fact that there are less (if any) potential licenses required to access channels and use the radio. What this means is that walkies tend to operate using pre-programmed frequencies that are widely available for public use, restricting you from tuning into any of the licensed ones. They tend to be cheaper and easier, but they do also have a shorter battery life a lot of the time as well as a more restricted range. If you want a more versatile two-way radio or walkie, you can purchase licensed ones as long as you apply and pay for a license. This will give you access to a much wider range of channels and, depending on your needs, could be the best option for you. Each country has companies that own the licensed frequencies, with VHF and UHF being owned by Ofcom in the UK. 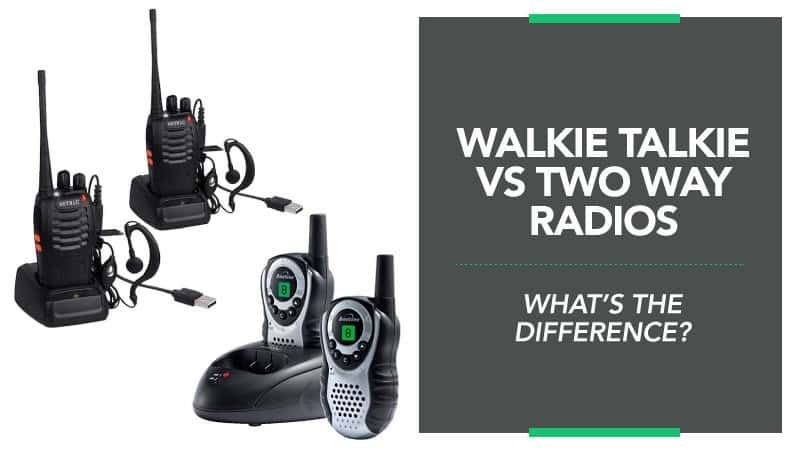 Hopefully, we have been able to give you a whole load of new and interesting information regarding the difference between the classic walkie talkie and a two-way radio. While they may be the same in many ways, there are a few differences that need to be noted so that you can make a good and reasonable choice based on your needs. We’d love to know if you found this guide helpful and interesting, so drop us a message with your thoughts in the comments below.